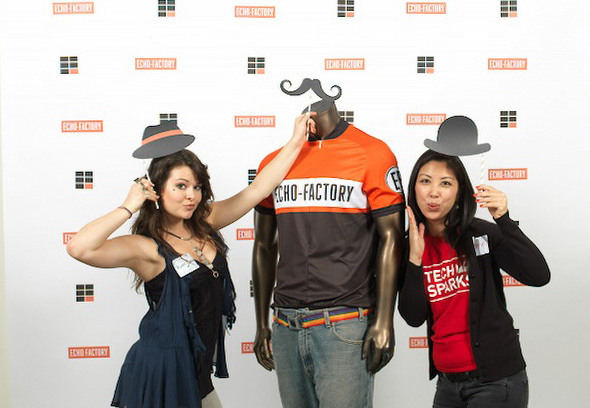 Last Wednesday, as a featured business on this year’s Techsparks Cross Campus Tech Crawl, Echo Factory opened its doors to the Pasadena innovation community, welcoming more than 100 of the area’s brightest entrepreneurs for a tour, some socializing, a drink or two and some great discussion. As one of five tech-affiliated businesses on the crawl, we hosted four groups averaging around thirty people each. Making the rounds between Cross Campus, Ayzenberg, Central Desktop and Ableton, visitors toured the Echo Factory office and studio, had their photo taken on our EF step-and-repeat, learned about our business and viewed some of our work. Did we mention the drinks? And the robot cake pops? Delicious. We at Echo Factory had a lot of fun and really enjoyed meeting and interacting with members of the Innovate Pasadena community. Being new in town, the crawl was a great way to make some new friends and learn more about the innovation going on each day all around us. And, let’s be real, who doesn’t value a solid excuse to drink it up with a bunch of smart, well-spoken, good-looking people? Thanks to Innovate Pasadena and Tech Sparks for hooking us up with this opportunity, and thanks to all who turned out, had a shot and talked some shop. We hope to see you again soon. In the meantime, check out our portfolio, we’re updating all the time.